Orient took the lead when Paul McCallum nodded a Dean Cox through ball beyond Mark Cousins for his second in as many games before Lloyd James converted from the spot after Clevid Dikamona handled in the box. It could have been more for the O’s but Dean Cox wrapped up victory with a stunning free kick after 56. Dagenham did grab a consolation right on the 90 minute mark when Cureton latched onto a through ball to lob Alex Ciask. Both sides were looking to bounce back from defeat in midweek in the League Cup with Dagenham going down 4-1 at Charlton while Orient narrowly lost at MK Dons2-1. 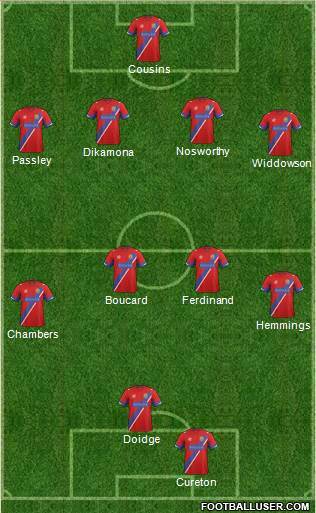 Dagenham made 4 changes from side that were brushed aside by the Addicks with Jamie Cureton, Christian Doidge, Ashley Hemmings and Josh Passley all being recalled to the starting 11. 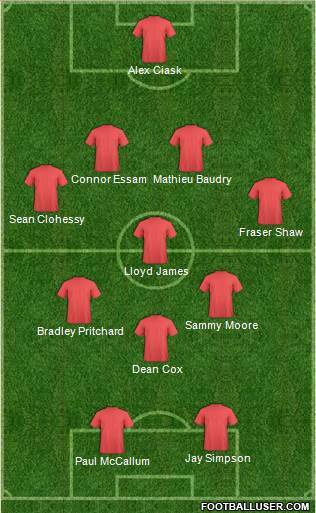 The O’s also made 4 changes to their side and welcomed back Fraser Shaw, Lloyd James, Jay Simpson and Paul McCallum. It was the same 11 that won against Barnet last weekend. In a scrappy start neither side was able to gain the initiative going forward but it was the home side who looked more threatening in the opening exchanges. Playing the midfield diamond once more, allowed Dagenham’s full back space down the wings which almost led to the first goal. Josh Passley advanced down the right crossing into the box, Alex Ciask looked far from convincing punching to Ashley Hemmings on the edge of the box. Hemmings shot fell to Jamie Cureton who could only knock the ball towards Kane Ferdinand at the back post but the former Peterborough man was not alert enough to stick the ball away. The away side began to get into their rhythm of passing with Dean Cox turning and shooting at Cousins on the edge of the box. Jamie Cureton continued to be a nuisance in attack for Daggers, playing on the shoulder of the last man but Orient were dealing well. The O’s did open the scoring after 19 minutes, neat play down the right saw Cox feed Pritchard, his cross bounced out of the box to Cox, he flicked the ball over his head to McCallum who nodded past the on-rushing Cousins. Dagenham defenders turned to the assistant referee who kept his flagged down. After the opener, Orient were fully in their flow with neat play all over the pitch, McCallum nearly doubled the lead just a minute later. A deep Clohessy cross from the right found McCallum who rose highest at the back post but saw his header bounce back off the woodwork. Dagenham were finding it hard to deal with Orient’s high press in the middle of the park with Cox, Moore and Pritchard all closing down well and forcing mistakes. Bradley Pritchard was continuing his fine early season form and nearly grabbed a goal for his efforts. High pressing in the middle saw him rob Joe Widdowson of possession. Pritchard advanced towards goal but his fierce shot was saved while McCallum could only put the rebound over. Orient were fully in the ascendancy and needed a second goal to ease the game out. The second did arrive just before the half hour, a Cox corner was handled in the box by Clevid Dikamona who was under pressure for O’s captain Mathieu Baudry. Lloyd James stepped up and slotted home from the spot to put Orient 2-0 up. Hendon’s side were in cruise control and backed by a strong 1400 away fans looked to put the game to bed with Simpson and McCallum going close. The O’s continued the second half as they finished the first with Cox, McCallum and Simpson bright and alert in the final third. Cox nearly grabbed a goal his performance deserved but his left foot shot crept agonizingly past the post. Clohessy was providing a real outlet down the right for Orient and his crosses were causing Dagenham all kinds of problems. McCallum should have grabbed his second but glanced Clohessy cross wide of the far post. Cox did grab a third for Orient and what a goal it was. After McCallum had been fouled 25 yards out, Cox stepped up and curled a stunning free kick beyond Mark Cousins into the top corner. The away side seemed to stand off after the third and Ciask had to make two great saves to preserve the clean sheet. First he saved well high to his right from a rising Christian Doidge effort before tipping a Doidge’s effort on to the bar. “The Clean sheet is important now” echoed between the three of us in the away end yesterday, seeing games out will be an important aspect this season especially away from home. Orient heeded the warning, pushing for a fourth with McCallum almost putting a tap in on a plate for Simpson but Widdowson just got back to clear. The right side was creating clear in roads to get forward with McCallum, Simpson and Cox combining but the latter scuffed his shot at Cousins. Then the game entered a frantic 2 minutes, somehow Orient did not grab a fourth with ever member of the 1456 away support unsure of how. After a sustained period of possession Cox, Palmer and Pritchard went close. Simpson had a shot cleared off the line and a header bounce back off of the bar but amazingly the score remained 3-0. Dagenham searched for a consolation goal towards the end and much to Hendon’s disappointment they grabbed it. A long ball forward by Clevid Dikamona found Jamie Cureton who volleyed first time over Ciask to make the score 3-1. A convincing win for Leyton Orient who continue to grow as a team, it appears that Hendon and his staff have created a team togetherness with no individuals. Key to fans and management, every out field play celebrated all 3 goals highlighting the unity within the group. Players seem to be wanting to play for each other and Hendon. Hendon revealed post match that Mathieu Baudry had suffered a twisted ankle and was unsure if he would be available on Tuesday for the visit of Stevenage. The O’s are beating what is in front of them at the moment and will have much harder tests this season but as Hendon said in pre season “always nice to get into a winning habit”.